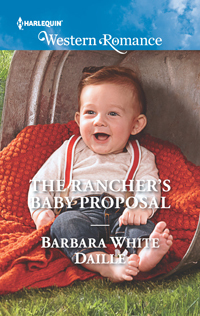 Today's featured book is The Rancher's Baby Proposal by Barbara White Daille. Hi. I'm thrilled to stop by the blog again, this time to share news of two special events. The first? Happy birthday a day early to our host, Kayelle! The second event is the book "birthday" of the next release in the Hitching Post Hotel series. Hope you enjoy the peek at the story. Still reeling from his last relationship, Reagan needs a babysitter for his month-old son. With Ally's help, he can get his family's ranch ready for sale and get out of Cowboy Creek. The problem? Ally is one seriously cute distraction. But Reagan will do whatever it takes to keep his heart safe. Even if it means losing the only place—and the only woman—he can call home. Barbara lives with her husband in the sunny Southwest. Though they love the warm winters and the lizards in their front yard, they haven't gotten used to the scorpions in the bathroom. Barbara also loves writing, reading, and chocolate. Come to think of it, she enjoys writing about those subjects, too! Barbara wrote her first short story at the age of nine, then typed "The End" to her first novel many years later...in the eighth grade. Now she's writing contemporary romance on a daily basis, with an ongoing series from Harlequin Western Romance (The Hitching Post Hotel), a brand-new series from Entangled Bliss (Snowflake Valley), and many more books in progress!. She would love to have you stop by her website and blog and to look for her the next time you're on Facebook and Twitter. Always good to see you. Love the baby on this cover. So cute! Your post got shared on Pinterest, Google+, Facebook and Twitter. And it's always a pleasure to visit, Kayelle. Again, happy birthday to you! Thanks for sharing my little guy with your readers. :) He really is such a cutie, isn't he!